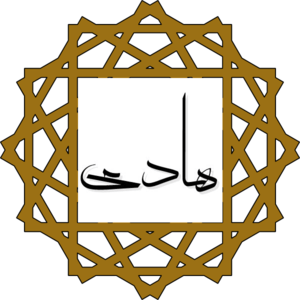 Alī ibn Muhammad ibn ‘Alī (Arabic: علی بن محمد بن علی‎‎‎; 828-868 C.E. ) commonly called Ali al-Hadi and Alī an-Naqī was known as al-Hadi. He was the tenth of the Twelve Imams after his father Muhammad al-Jawad and before his son Hasan al-Askari. He remained in Medina teaching until the age of 30 when he was summoned to Samarra by the Abbasid caliph Al-Mutawakkil. There he was treated roughly by the caliph and his successors until, according to Shiite accounts, he was poisoned through intrigue of Al-Mu'tazz the Abbasid caliph, in 254/868, and was buried in Samarra. After Motawakkel came to throne, the governor of Medina, ʿAbdallāh ibn Moḥammad, wrote the caliph warning him about the activity of al-Hadi saying that he was given money with which he could buy weapons that could be used to revolt against the Caliph. When al-Hadi learned of what Abdullah bin Muhammad had told the caliph, he sent a letter to Mutawakkil defending himself against the accusations and complained about the governor. Apparently convinced of the harmless piousness of al-Hadi, Motawakkel wrote back to al-Hadi stating that he had deposed the governor. He nevertheless asked the Imam to come to Samarra (a military camp, not far from Baghdad which was the capital of Abbasids at the time). [lower-alpha 1] At the same time, Mutawakkil ordered Yahya ibn Harthama, the captain of the guard, to go to Medina both to investigate Abdullah's claims and to bring al-Hadi to Samarra. Yahya then searched the Imam's house and found nothing more than copies of the Quran and other religious books. It is said that when the imam approached Baghdad many people gathered to see him. The governor of the city himself rode out of the city to welcome him and stayed a part of night with him. At Sammera, however, the caliph did not immediately receive him, though assigned a house for his staying. It is said that once a scholar came in where al-Hadi had a meeting with masters of Hashemite (a clan Muhammad, the prophet had belonged to). Al-Hadi seated the scholar beside himself and treated him with great respect. The Hashemite protested saying: "why do you prefer him to the masters of Banu Hashim?’ Al-Hadi said: "Beware to be from those whom God has said about, Have you not considered those who are given a portion of the Book? They are invited to the Book of Allah that it might decide between them, then a part of them turn back and they withdraw. [lower-alpha 2] Do you accept the Book of Allah as a judge?" asked al-Hadi. They all said, "O son of the messenger of God, we do." Then al-Hadi tried to prove his stance by saying, "Has Allah not said Allah will exalt those of you who believe, and those who are given knowledge, in high degrees? [lower-alpha 3] Allah does not accept for a knowledgeable believer but to be preferred to an unknowledgeable believer, just as He wants a believer to be preferred to an unbeliever. Allah has said, Allah will exalt those of you who believe and those who are given knowledge, in high degrees. Has He said, Allah will exalt those, who are given honor of lineage, in high degrees? Allah has said, Are those who know and those who do not know alike? [lower-alpha 4] Then, how do you deny my honoring him for what Allah has honored him?" It is said that Mutawakkil showed courtesy toward the imam in Samarrah, and even preferred his judgment to other Faqihs; in the same time however, he troubled and even tried to kill the Imam. [lower-alpha 5][lower-alpha 6] Mutawakkel was envious of the Imam because Imam’s position was exalted among the public. He wanted to belittle the Imam. His vizier counseled him, recommending him to give up, because it would make the public blame and criticize him. But he paid no attention to his vizier. To try to humiliate the Imam, Motawakkil ordered that the Imam along with the officials and notables, (so that it wouldn't look like the act was intended for the imam) dismount and travel on foot during a hot summer day while the caliph remained mounted on his horse. Zuraqa the chamberlain of al-Mutawakkil has narrated that he saw the Imam who had almost suffered a heat stroke, was breathing and sweating hard, so he approached him to calm him down by saying "Your cousin (Mutawakkil) did not intend to hurt you particularly." Al-Hadi looked at him and said "Stop that!" And then recited this Quranic verse,Enjoy yourselves in your abode for three days, that is a promise not to be belied. [lower-alpha 7] The promise here refers to the punishment which is mentioned in the previous verse for unjust people . [lower-alpha 8] Zuraqa related that he had a Shiite teacher who had been among his intimate friends. Zuraqa says "when I went home, I sent for him. When he came to me, I told him about what I heard from the Imam. He changed color and said to me, Be careful and store all what you have! Al-Mutawakkil shall die or be killed after three days. I was affected by his speech and asked him to leave. Then I thought with myself and said that it would not harm me to take precautions. If something like that happened, I would have taken my precaution, and if not, I would lose nothing. I went to the house of al- Mutawakkil and took all my money. I deposited them with one of my acquaintances." Within three days of that event, plotters assassinated the caliph; one of the assassins was actually his son, al-Muntasir. al-Hadi narrated from his forefathers that the Prophet said, "Love Allah for the blessings He gives you, and love me for the love of Allah, and love my household for my love!" Madelung quotes Ebn Babuya as saying that al-Hadi was poisoned by Al-Mutawakkil or Al-Mu'tamid, though neither of them were Caliph at the time of his death. According to Tabatabai, however, al-Hadi was poisoned in the intrigue of Al-Mu'tazz who was caliph at the time. Most reliable sources say that al-Hadi died in 868. Al-Mu'tazz sent his brother abu Ahmad to lead the funeral prayer. However, because of the large crowd of people who came to the funeral and due to the crying and tumult, his corpse was returned to his house and was buried in its courtyard. The tomb of al-Hadi which became also the tomb of his son Hasan al-Askari afterwards, is an important place of Shiite pilgrimage. It was bombed in February 2006 and badly damaged. Another attack was executed on 13 June 2007, which led to the destruction of the two minarets of the shrine. Authorities in Iraq said Al Qaeda was responsible for the attack. Besides Hassan Askari, three sons (i) Hussain (ii) Muhammad (iii) Jafar and one daughter “Ailia” from different wives have been mentioned by various biographic scholars, including Shaikh Mufeed. Issues of these sons are traceable in different pedigree books published by researchers from time to time. ↑ according to Madelung this letter as quoted by Kolaynī and Shaikh Mofīd may be authentic though its date was wrongly conveyed to Mofid as 243/857 instead of 233/848. ↑ It is said that Mutawakkil once gave order for his assassination and "In open durbar he ordered his chamberlain to bring the imam to his presence, and summoned four servants with naked swords to stand ready when the order was given to slay him. When the Imam left the hall of audience, the four servants stood by the door with drawn swords, but instead of striking him they threw away the swords, and fell at his feet and humbly saluted him. Mutawakkil inquired the cause of such strange conduct. They said that they saw near the Imam a person with a drawn sword 'who said: 'If you give any trouble to the Imam I will slay you all,' so they dared not obey the Caliph's order to slay him." ↑ According to Tabatabai Mutawakkil especially opposed to Ali, whom he cursed openly. 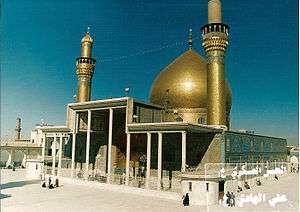 He even ordered the mausoleum of Husayn in Karbala to be torn down to the ground. ↑ The statement of 7 sons has been made by "Moulvi Syed Basheer Hussain compiler of "Shajrat-e-Saddat-e-Amroha". These seven names have also been referred in by the writer of book "Anwar-e-Alsadat" remarking the point of controversy in number of sons. In addition, there are at least two personalities whose hand written pedigree from top (Ali al-Naqi) to bottom confirm the sons of Imam Ali al-Naqi al-Hadi as seven in number. ↑ A Brief History of The Fourteen Infallibles. Qum: Ansariyan Publications. 2004. p. 155. 1 2 al-Qurashi, Baqir Shareef (2005). The Life of Imam al-Hasan al-Askari. Qum: Ansariyan Publications. p. 16. ↑ Kitab al-Irshad, by Al-Shaykh Al-Mufid, pg.334, 506. ↑ Kashful Ghummah, by Ali Ibn Isa al-Irbili, Vol.2, pg.334. 1 2 3 4 5 Tabatabai, Sayyid Muhammad Husayn (1997). Shi'ite Islam. Translated by Seyyed Hossein Nasr. SUNY press. pp. 183–184. ISBN 0-87395-272-3. ↑ Tabåatabåa'åi, Muhammad Husayn (1981). A Shi'ite Anthology. Selected and with a Foreword by Muhammad Husayn Tabataba'i; Translated with Explanatory Notes by William Chittick; Under the Direction of and with an Introduction by Hossein Nasr. State University of New York Press. p. 139. ISBN 9780585078182. 1 2 3 4 5 6 7 8 9 10 11 12 Madelung, Wilferd. "ʿALĪ AL-HĀDĪ". Encyclopedia of Iranica. Retrieved September 14, 2015. 1 2 3 Momen, Moojan (1985). An Introduction to Shi'i Islam. Yale University Press. pp. 43–44. ISBN 978-0-300-03531-5. 1 2 Moezzi, Mohammad Ali Amir (1994). The Divine Guide in Early Shi'ism : The Sources of Esotericism in Islam. State University of New York Press. p. 65,174. ISBN 9780585069722. 1 2 3 4 5 6 7 Donaldson, Dwight M. (1933). The Shi'ite Religion: A History of Islam in Persia and Irak. BURLEIGH PRESS. pp. 210–216. ↑ Adamec, Ludwig W. (2010). Historical Dictionaries of Religions, Philosophies, and Movements. Scarecrow Press. p. 277. ISBN 978-0810871724. ↑ "Blast hits key Iraq Shia shrine". BBC. Retrieved September 14, 2016. 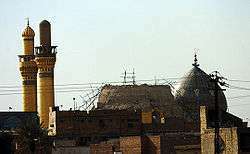 ↑ "Iraqi blast damages Shia shrine". BBC. Retrieved September 14, 2016. 1 2 Naqvi, Syed Maqsood (1991). Riaz-ul-Ansab (in Urdu). Lahore, Pakistan: Izhar Sons Printer. p. 81. ↑ Najfi, Maulana Syed Safdar Hussain (2014). Ahsanul Maqal ( Translation of Arabic Book Muntahal Aamaal fi tarikh al-Nabi wal Aal compiled by Sheikh Abbas Qumi) (in Urdu). Lahore, Pakistan: Misbahulquran Trust. pp. 261–262. ↑ Ahmed Ali, Syed (1991). Hazrat Imam Ali Naqi (Translation of Book compiled by Association of Writers of Idra Dar-e-Raha Haq, Qum Iran (in Urdu). Karachi, Pakistan: Dar'us Saqafa ul-Islamia. p. 5 & 6. ↑ Jawwadi, Syed Zeeshan Haider (2000). Biography of 14 Infallibles (in Urdu). Karachi, Pakistan: Mahfooz Book Agency (2nd Edition). p. 588.